1775. The kingdom of Asante has conquered its northern neighbor, Dagbon, and exacted an annual tribute of 500 slaves. Ama is a story of the eponymous heroine who is caught up in the aftermath of these events. Ama passes successively through the hands of the Dagomba, the Asante, the Dutch at Elmina, a British slave captain and Brazilian slave traders before ending up on a sugar estate in the Bahian RecÃ´ncavo. The point of view is Ama's throughout; yet while it is a consistently African point of view, the universality of the story's basic premise, that the cruelest oppression cannot erase mankind's love of liberty, transcends the particularities of geography and period. The principal locations in which the story unfolds are a small hamlet in the savannah, in what is now the Northern Region of Ghana, the town of Yendi, the royal palace in the city of Kumase, Elmina Castle, a slave ship, The Love of Liberty and a sugar estate in Bahia, Brazil. The plot of Ama is simple. The protagonist is captured and eventually transported to Brazil. Ama adopts various strategies in her struggle against the deprivation of her liberty, striking a balance between, on the one hand, escape and resistance and, on the other, accommodation to the realities of the power of her oppressors. Ama is the principal character and the only one present from beginning to end. She is seventeen when the story starts, a simple country girl. Responding to hard experience, her character and moral strength develop and she becomes wiser and more resourceful and sophisticated. Prematurely aged at the end of the story, she has lost her eyesight but none of her spirit. Other characters include Abdulai, leader of slave raiders; Itsho, Ama's lover; Ya Na Saa Ziblim*, King of Dagbon; Koranteng PÃ©te*, Asante conqueror of Dagbon and later regent in the reign of Osei Kwame; Osei Kwadwo* and Osei Kwame*, fourth and fifth Asante kings; Konadu Yaadom*, Asantehemaa (or 'queen mother'); Esi, a pawn in the royal palace; Pieter De Bruyn, governor at Elmina, who takes Ama as his concubine and teaches her English; Hendrik van Schalkwyk, lecherous chaplain; Augusta, Fanti slave trader; Jensen, Danish chief merchant; Richard Brew*, slave trader at Anomabu; David Williams, captain of The Love of Liberty, William Williams, the captain's nephew, later British consul in Salvador; various British seamen; Butcher, ship's doctor; Nana Esi, slave; Tomba, slave from the Upper Guinea Coast, later Ama's husband; Josef, Fanti slave and his Yoruba wife, Wono; Olukoya, Yoruba babalorixa; the Senhor, owner of the sugar estate; the Senhora, his wife; Miranda, their daughter! ! ; Father Isaac, Catholic chaplain; and Jesus Vasconcellos, the Senhor's successor. (Asterisks indicate historical persons.) The essential conflict in this story is between Ama and those who would deprive her and her fellow slaves of their liberty. In a broader sense, it is between the slaves and the world economic order of the time represented by the shadowy capitalists in remote metropolitan centres who were the ultimate beneficiaries of the slave trade and slavery. There is a great deal of violence in this story. It is not arbitrary violence. Slaves lived their lives under constant threat of brutality. The crisis which gives the story its initial impetus is the capture of Ama (still known by her birth name, Nandzi) by a Dagomba raiding party, in the course of which Abdulai, its leader, rapes her. The final climax is the dreadful vengeance which Tomba wreaks upon Jesus Vasconcellos for what he has done to his wife. This novel deals frankly with the role which African rulers and merchants played in the slave trade; at the same time it distinguishes between the function and nature of slavery in Africa and the chattel slavery of the Europeans. Ama finds herself at the receiving end of ideologies of slavery practiced by Islam and Christianity. Her own religious beliefs sustain her and her spiritual life is enriched by new forms of African religious experience which she encounters in Bahia. In its depiction not only of the slaves but also of the more humane of their oppressors, the novel treats with sympathy the difficult moral choices which face those who challenge the accepted ideologies of their society and times. Injustice, the oppression of the weak by the strong, did not vanish with the abolition of slavery. It is the similar moral choices which confront us in the modern world which lend this historical novel its contemporary relevance. These last paragraphs might suggest that Ama is a political tract. It is nothing of the sort. It is a story of real, warm-blooded people, living out their short lives in difficult times. Ama is a book aimed at dispelling the racist myths that have infiltrated our Modern Society (the period from 1500 to present). It focuses on the humanity of the individual slave, rather than slavery as a whole. Slave life becomes more real to the audience, and beyond that, very emotionally gripping. See Ama get raped and all the ones she loves killed. Every aspect of her life is so transient and depressingly fleeting. I gave it a 3 because some of the writing is very silly and cliche, and a little longwinded, but it's definately a good read. It pegs right into the historical fiction category and contrary to the title, focuses a lot of energy and time in intra-African slave trading. This is an aspect many ignore when approaching the topic of slave trade from a US vantage. 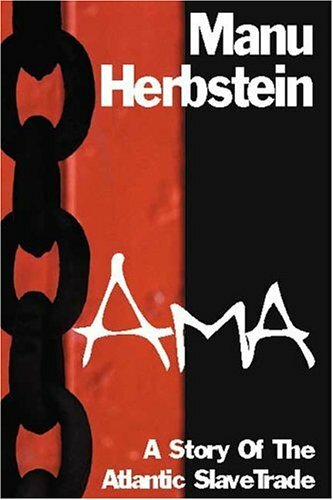 I read Herbstein's novel just prior to departing the US for Ghana. The novel is so well written that I actually felt as if I'd been at Elmina castle and travelled the dark African night with Nandizi. Upon entering the castle at Elmina, strangely, I knew my way around. Everything was exactly as pictured in my mind's eye. I connected with the novel's protagonist and had a re-new-ed pride in the spirit of my ancestors. It is well worth struggling through the unfamiliar names to discover the familiar in the human spirit that spans the ages. A must read for everyone!!!! I was required to read this book for my African history class. I really liked the book because it connected the pieces of the slave trade from Africa (Ghana) starting with how the girl got into slavery to being sold at the coast to life on the ship, finally working as a slave in the New World (Brazil). Also, it has a lot historical context/traditions (of Yoruba, Asante, and others) incorprated into the book. I think everyone should read just to understand the complexities of the slave trade b/c the book really doesn't point fingers at one group of people, it points them at everyone for what happened dealing with slavery. It does good job of dispelling the myths of slavery and enables the reader to realize the full psychological along with the physical impact of slavery. The author takes us on an incredible journey with the slave Ama from her life in her own village, through several captivities and to her life in South America. What is fascinating to me about this novel is that it looks at the Middle Passage through the eyes of one woman. While Ama is a fictional character, and we don't know what happed specifically to an individual slave the book makes the reader think, really think about what could happen about the march to the sea, and the perilous middle passage. Worth reading! Brings home the ugly reality of slavery without falling into the trap of romanticising any of the white or black societies who were responsible for treating anyone who looked different, or came from another tribe, or was female, like a thing to be exploited rather than a human being. At the start of the book Nandzi, the heroine, is looking after her little brother and is complaining to herself about the daft and inconvenient marriage practices of her tribe. But then a raiding party from another tribe attacks her home and she soon has even more serious things to worry about. Carried off as a slave, Nandzi is not even allowed to keep her name: the title of the book, Ama, is the first of the new names imposed on her by successive owners to suit their convenience. Nandzi is given the name Ama by an African princess to whom she is given as a present and who is one of the few owners who treats her with any decency or compassion. Later a Dutchman renames her Pamela. The first 116 pages of the book tell the story of the rapes, beatings, and injustices inflicted on the heroine by her fellow africans, and her repeated narrow escapes from being murdered: the remainder of the book tells of the sexual abuse, beatings and injustice inflicted on her by white men after the regent of the African kingdom where she has been enslaved decides to sell her to the dutch. But through her ordeals at the hands of successive slavers both white and black, Nandzi/Ama/Pamela retains her intelligence, courage, and a love of freedom. A number of chapters in the book begin with short factual statements which are well chosen to illustrate how the crimes against humanity in the novel reflect those in real history.